Religiously unaffiliated Americans tend to be, almost by definition, less religious than Americans who belong to a religious tradition. In Pew Research Center surveys, the unaffiliated are less likely than the general public as a whole to say that religion is very important in their lives, to attend worship services regularly and to pray on a daily basis. At the same time, the unaffiliated are not wholly secular. Substantial portions of the unaffiliated – particularly among those who describe their religion as “nothing in particular” – say they believe in God or a universal spirit. And while 42% of the unaffiliated describe themselves as neither a religious nor a spiritual person, 18% say they are a religious person, and 37% say they are spiritual but not religious. There is little evidence that the unaffiliated are, by and large, “seekers” who are searching for a religion that fits them or that they have embraced New Age spirituality, Eastern religious ideas or other beliefs from non-Abrahamic faiths. Only about one-in-ten U.S. adults who identify their current religion as “nothing in particular” say they are looking for a religious affiliation. The unaffiliated are about as likely as others in the general public to believe in reincarnation, astrology and the evil eye. And they are only slightly more likely to believe in yoga as a spiritual practice and in spiritual energy located in physical things such as mountains, trees and crystals. Compared with other adults in the general public, the unaffiliated are less likely to say that belonging to a community of people who share their beliefs and values is very important to them. And their views of churches and other religious organizations are decidedly mixed. A majority agree that religious organizations strengthen community bonds and play an important role in helping the poor and needy. But most also say that religious organizations are too concerned with money and power, too focused on rules and too involved in politics. The unaffiliated also are more skeptical than others in the general public of the idea that churches and other houses of worship contribute to solving important social problems, and the notion that religious organizations protect and strengthen morality in society. 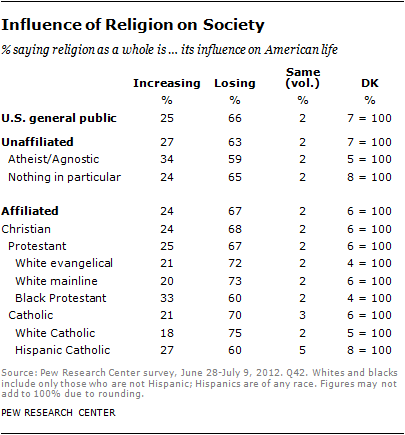 Both the affiliated and the unaffiliated tend to agree that religion is losing influence on society today. Unlike the general public, however, the unaffiliated are divided over whether a decline in religion’s influence on society is a good or bad thing. The religiously unaffiliated are comprised of three distinct subgroups. About three-in-ten of the unaffiliated describe their religion as either atheist (12%) or agnostic (17%), while about seven-in-ten describe their religion as “nothing in particular” (71%). As expected, there is a wide gulf between the religiously unaffiliated and others in the general public when it comes to the importance of religion in their lives. Roughly two-thirds of the unaffiliated (65%) say that religion is not too or not at all important in their life. About eight-in-ten atheists and agnostics say religion is not too or not at all important to them (84%), as do more than half of those who describe their religion as “nothing in particular” (58%). By contrast, just 8% of affiliated Christians say religion is not too or not at all important to them; about seven-in-ten (68%) describe religion as very important in their lives. The Pew Research Center/Religion & Ethics NewsWeekly survey asked respondents whether they consider themselves to be “a religious person” and, in a separate question, whether they consider themselves to be “a spiritual person.” Responses to these questions provide a window into the degree to which levels of self-identified spirituality and religiosity overlap among U.S. religious groups. All told, about two-thirds of U.S. adults (65%) describe themselves as religious (either in addition to be being spiritual or not). Nearly one-in-five say they are spiritual but not religious (18%), and about one-in-six say they are neither religious nor spiritual (15%). Among all those with a religious affiliation, about three-quarters (75%) consider themselves religious, one-in-six (15%) consider themselves to be spiritual but not religious, and fewer than one-in-ten (8%) say they are neither. By contrast, among the religiously unaffiliated, 18% describe themselves as religious, 37% say they are spiritual but not religious, and about four-in-ten say they are neither (42%). Among atheists and agnostics, 57% say they are neither spiritual nor religious, while a third consider themselves to be spiritual but not religious (34%). 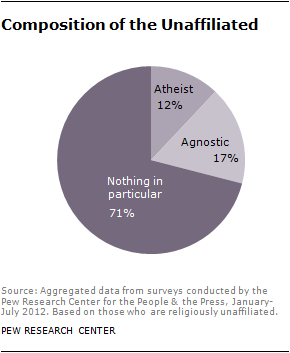 Just 7% of atheists and agnostics describe themselves as religious. Among those who say their religion is “nothing in particular,” about a quarter say they are a religious person (23%), nearly four-in-ten say they are spiritual but not religious (39%), and about a third say they are neither religious nor spiritual (36%). 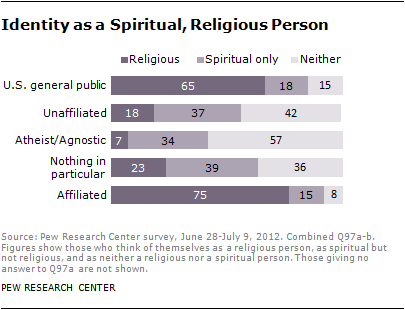 A sizable minority of those in the general public who consider themselves to be spiritual but not religious are unaffiliated (32%), but fully two-thirds have a religious affiliation. Among those who say they are neither spiritual nor religious, about half are unaffiliated (52%), 45% are affiliated with a religion, and the remainder did not specify a religious affiliation. Not surprisingly, about nine-in-ten of those who consider themselves to be a religious person (whether or not they also consider themselves spiritual) are affiliated with a religion (94%). When it comes to religious practice and commitment, those who say they are spiritual but not religious tend to fall between the religious and those who describe themselves as neither religious nor spiritual. For example, 44% of the spiritual but not religious say they pray daily. By comparison, 73% of those who describe themselves as a religious person pray daily, and just 11% of those who say they are neither do so. And although nine-in-ten of the spiritual but not religious say they believe in God (92%), they express less certainty in this belief than do those who describe themselves as religious. Both groups are more likely than people in the “neither” category to believe in God, however. Demographically, the spiritual but not religious are similar to those who are neither religious nor spiritual in terms of higher education; about a third of both groups have graduated from college. They differ in age and marital status, however. The spiritual but not religious tend to be older than those who are in the “neither” group. And while both groups are more likely to be unmarried than those who describe themselves as religious, the spiritual but not religious are more likely than those who are neither to be living with a partner or to be divorced, separated or widowed. When it comes to politics, voters who are spiritual but not religious generally favor the Democratic Party and more often describe themselves as liberal (36%) or moderate (35%) than conservative (26%). 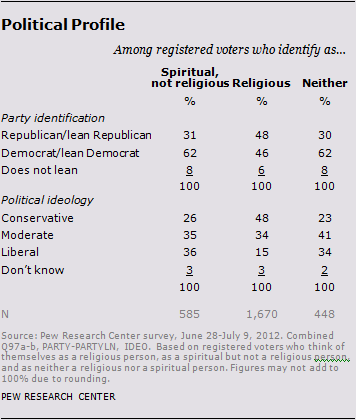 On these questions, they resemble voters who are neither spiritual nor religious. Registered voters who describe themselves as religious, by contrast, are much more inclined to call themselves conservatives (48%) than liberals (15%), and they are about evenly split in their support for the two major political parties. Relatively few people who say their religion is “nothing in particular” are actively seeking to affiliate with a religious group. 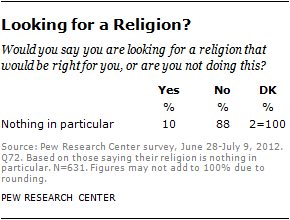 Just one-in-ten describe themselves as looking for a religion that is right for them, while 88% say they are not looking. As expected, the religiously unaffiliated are less likely than the general public as a whole to believe in God. 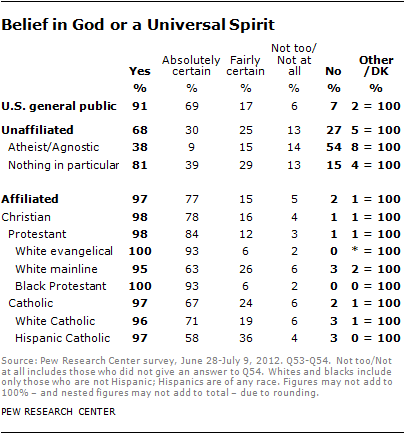 However, there are stark differences in this regard between the unaffiliated who identify themselves as atheist or agnostic and those who describe their religion as “nothing in particular.” Among the “nothing in particulars,” about eight-in-ten (81%) say they believe in God or a universal spirit – and a plurality of those who believe in God say they are “absolutely certain” about this belief. In addition, about four-in-ten atheists and agnostics (including 14% of atheists and 56% of agnostics) say they believe in God or a universal spirit. By contrast, belief in God is nearly universal among Christians; fully 98% of self-identified Christians also say they believe in God. In addition, the overwhelming majority of Christians (both Protestants and Catholics) say they are absolutely certain about their belief in God or a universal spirit. 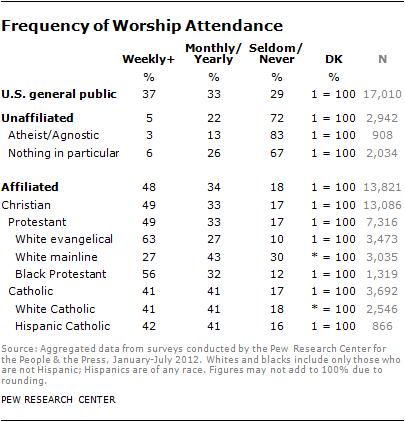 Not surprisingly, the unaffiliated stand out from other religious groups in the U.S. for their infrequent attendance at worship services. Just 5% of the unaffiliated report going to worship services at least once a week, compared with about half of Protestants (49%) and four-in-ten Catholics (41%). The overwhelming majority of the unaffiliated say they seldom or never attend worship services apart from weddings or funerals. Fully 83% of atheists and agnostics seldom or never attend worship services, and the same is true of 67% of those with no particular religious affiliation. White evangelicals and black Protestants stand in stark contrast to the unaffiliated in terms of self-reported levels of church attendance. About two-thirds of white evangelicals (63%) and 56% of black Protestants say they attend church services at least once a week; only about one-in-ten of each group (10% among white evangelicals and 12% among black Protestants) say they seldom or never attend services. What Keeps People Out of the Pews? Among American adults who say religion is either very or somewhat important in their lives, two-thirds also say they attend religious services at least once a month (67%). But one-third report attending less often. The Pew Research Center/Religion & Ethics NewsWeekly survey asked this second group of people – those who consider religion at least somewhat important but who attend worship services seldom, never or only a few times a year – to explain in their own words why they do not attend services more frequently. They offered a wide variety of reasons, including personal priorities, practical difficulties getting to services, and concerns about religion generally or in specific faiths and congregations. The religiously unaffiliated who were asked this question were particularly likely to give religion-related reasons for not attending services more frequently. About six-in-ten (59%) of the unaffiliated asked about this cited some kind of religion-related reason. The most common response, given by 28% of the unaffiliated asked this question, concerns disagreements with the beliefs of the religion or their church leaders, or beliefs that attending worship services is not particularly important. Other religion-related reasons include mentions of hypocrisy or the idea that church leaders were too pushy or demanding in terms of pushing beliefs or actions among congregants. Roughly one-in-six (17%) unaffiliated respondents asked this question cite reasons related to their personal priorities, such as being “too busy” to attend religious services. A similar proportion (15%) cite practical difficulties getting to worship services, including work schedules, lack of transportation, health problems or mobility issues due to aging. Adults with a religious affiliation who consider religion at least somewhat important in their lives yet who attend services relatively infrequently provide a similarly varied list of reasons. Compared with the unaffiliated, however, those with a religious affiliation are more likely to cite practical issues in getting to services (24% vs. 15% among the unaffiliated asked). And the affiliated were less likely to cite objections to religious organizations or give other religion-related reasons. In sum, 37% of those with a religious affiliation gave a religion-related reason for their relatively infrequent attendance, compared with 59% of the unaffiliated. Religiously unaffiliated Americans are less likely than others in the general public to pray outside of worship services. About one-fifth of the unaffiliated say they pray at least once day (21%), another fifth pray at least once a month, and about six-in-ten seldom or never pray (58%). 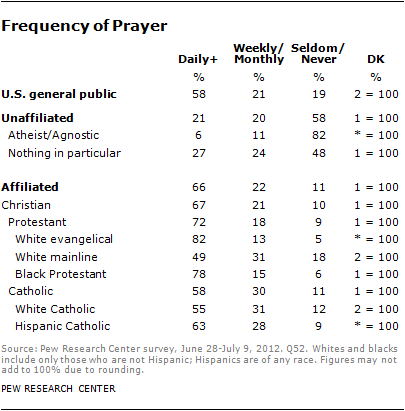 But there are sizable differences between atheists/agnostics and other unaffiliated adults in frequency of prayer. About eight-in-ten atheists and agnostics seldom or never pray (82%). People who describe their religion as “nothing in particular,” however, are almost evenly divided between those who seldom or never pray (48%) and those who pray either daily (27%) or at least once a month (24%). Neither subgroup of the unaffiliated prays as often as the religiously affiliated, however. Among Protestants, 72% say they pray at least once a day, as do 58% of Catholics. White evangelicals and black Protestants are particularly likely to report that they pray at least once a day (82% and 78%, respectively). White mainline Protestants pray less frequently, with about half doing so at least once a day (49%), three-in-ten praying at least once a month (31%) and about a fifth saying they seldom or never engage in prayer (18%). For the most part, the religiously unaffiliated look similar to Christians on these beliefs. For example, the unaffiliated are about as likely as Christians to believe in reincarnation, astrology or the evil eye. There are two exceptions, however. 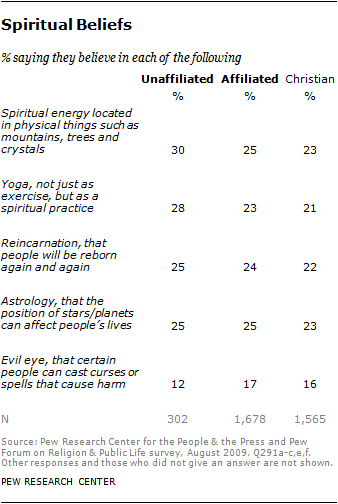 The unaffiliated are somewhat more likely than Christians to believe in spiritual energy in physical things such as mountains, trees and crystals (30% vs. 23%), although this is a minority viewpoint within both groups. The unaffiliated also are somewhat more likely than Christians to believe in yoga as a spiritual practice (28% vs. 21%), though again, this is a minority viewpoint among both the unaffiliated and Christians. 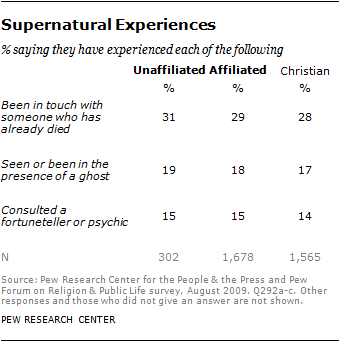 The 2009 survey also found few differences between the unaffiliated and Christians in terms of self-reported experiences with the supernatural. Roughly equal portions of the unaffiliated (31%) and of Christians (28%) report having been in touch with someone who has died. Similarly, roughly one-in-six of each group has used a fortuneteller or psychic (15% among the unaffiliated, 14% among Christians). And 19% of the unaffiliated and 17% of Christians report having seen or been in the presence of a ghost. Overall, the religiously unaffiliated are less likely than Christians to report having had a moment of sudden religious insight or awakening. The Pew Research Center/Religion & Ethics NewsWeekly survey also asked about the value respondents place on belonging to a community of people who share their values and beliefs. About half of the general public (49%) says that belonging to a community that shares their values and beliefs is very important to them, while 34% say it is somewhat important, and 16% say it is not too or not at all important. 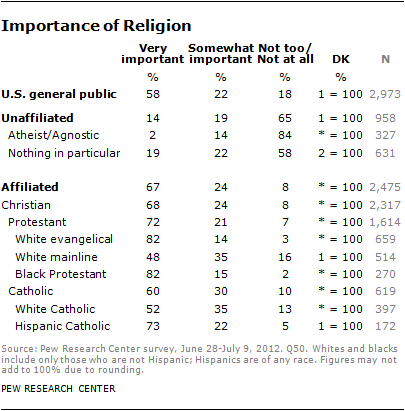 The religiously unaffiliated place far less importance on this than do other groups. Among the unaffiliated, about three-in-ten say that belonging to a community of like-minded people is very important to them (28%), a roughly equal portion say it is not too or not at all important (31%), and four-in-ten say it is somewhat important to them. Atheists and agnostics (22%) are even less likely than people who say their religion is “nothing in particular” (31%) to consider this to be very important. About half of all Christians say belonging to a community of people with shared values and beliefs is very important (53%), and a third say it is somewhat important (34%). White evangelicals, black Protestants and Hispanic Catholics are somewhat more likely than white mainline Protestants and white Catholics to consider this to be very important. The new survey also included two questions that address the frequency of spiritual reflection outside of an explicitly religious context. One question asked how often respondents reflect on the meaning of life, and a second asked how often respondents feel a deep connection with nature. The findings suggest that the unaffiliated are less likely than other religious groups to think about the meaning and purpose of life. However, the religiously unaffiliated are no less likely than the public overall to say they often feel a connection with nature and the earth. 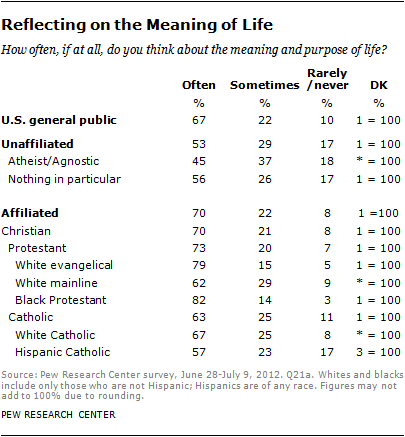 Seven-in-ten Christians report that they often think about the meaning and purpose of life. Results on this question among Christian groups range from 57% among Hispanic Catholics and 62% among white mainline Protestants to about eight-in-ten among white evangelicals (79%) and black Protestants (82%). By comparison, fewer unaffiliated Americans say they often think about the meaning and purpose of life. About half of the unaffiliated (53%), including 56% of those who are “nothing in particular” and 45% of atheists and agnostics, say they often think about the meaning and purpose of life. About three-in-ten of the unaffiliated (29%) say they sometimes do so, and 17% say they rarely or never do so. When it comes to feeling a connection with nature and the earth, there are relatively few differences among religious groups. About six-in-ten adults in the general public (58%) say they often feel a deep connection with nature, while 26% sometimes feel such a connection and 13% say they rarely or never do. The unaffiliated are about as likely as Christians to say they often feel a deep connection with nature (58% and 59%, respectively). 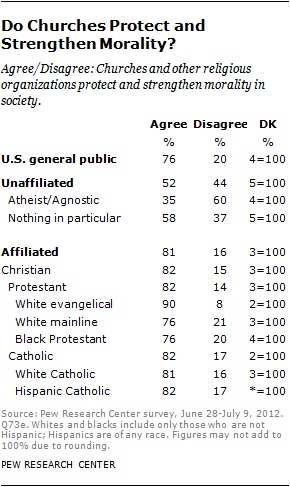 Religiously unaffiliated Americans, on the whole, express ambivalence about churches and other religious organizations. On the one hand, a majority agree that religious organizations have positive effects on society, such as bringing people together and playing an important role in helping the poor and needy. On the other hand, a majority of the unaffiliated also say that religious organizations are too focused on money and power, on rules and on politics. Adults with a religious affiliation (including Christians and members of other faiths) are even more strongly inclined to say that religious organizations have positive effects on society, and they are less likely than the unaffiliated to be critical of churches and other religious organizations. Overwhelming majorities of all U.S. religious groups see churches and other religious organizations as important in helping the poor and needy in society. Three-quarters of atheists and agnostics say churches play an important role in helping the poor and needy, as do 77% of those who say they are “nothing in particular.” About nine-in-ten Protestants (90%) and Catholics (89%) say the same. Similarly, sizable majorities of all U.S. religious groups agree that churches and other religious organizations bring people together and strengthen community bonds. Eight-in-ten people with no particular religion (and 73% of atheists and agnostics) agree that churches help build community bonds. About nine-in-ten Protestants (91%) and Catholics (89%) also agree. Two-thirds of the general public believes that churches, synagogues and other houses of worship contribute either some (40%) or a great deal (26%) to solving important social problems. Large majorities have expressed this view for more than a decade. The unaffiliated, however, are more skeptical than the public as a whole about the contribution of religious organizations to solving social problems. While seven-in-ten of those with a religious affiliation say that churches and other houses of worship contribute either some or a great deal to solving social problems, 45% of the unaffiliated say the same. People who describe their religion as “nothing in particular” are evenly divided between saying houses of worship make at least some contribution to solving social problems (48%) and saying they contribute not much or nothing at all (47%). But atheists and agnostics are more negative in their assessments: While 35% say houses of worship contribute either some or a great deal, a 63% majority say they contribute not much or nothing at all to solving important social problems. Religiously unaffiliated Americans also tend to differ from people with a religious affiliation in their views on the influence of organized religion on morality. Overwhelming majorities of Christian groups agree that churches protect and strengthen morality in society, including 90% of white evangelical Protestants and three-quarters of white mainline Protestants (76%) and black Protestants (76%). About eight-in-ten Catholics (82%) say the same. By contrast, 52% of the unaffiliated agree that churches protect and strengthen morality in society, while 44% disagree. Among those who say they have no particular religion, a majority (58%) agrees that churches protect and strengthen morality. Among atheists and agnostics, 35% view churches and other religious organizations as protecting and strengthening morality, while 60% disagree. Public views are divided about some aspects of organized religion, with the unaffiliated more likely than other groups to see a downside to organized religion. A majority of the unaffiliated agrees that churches are too focused on rules (67%), too concerned with money and power (70%), and too involved with politics (67%). Atheists and agnostics are particularly likely to agree with each of these negative statements about churches and other religious organizations. Religiously affiliated Americans are more closely divided in their assessments of religious organizations. For example, among Catholics, 56% agree that churches are too focused on rules, about half (48%) say they are too concerned with money and power, and almost as many (43%) say churches are too involved in politics. 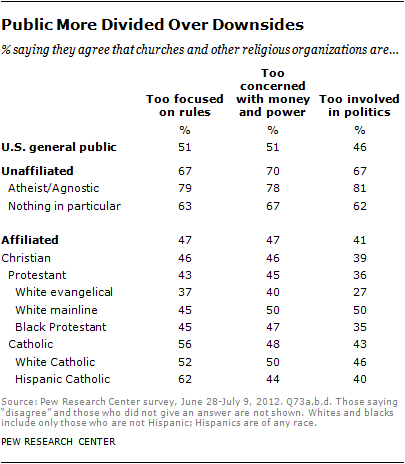 Protestants are less likely than Catholics to see churches as too focused on rules. White evangelical Protestants stand out as least likely to say that churches are too involved in politics, and they are also less likely than other groups to see churches as too focused on rules. Two-thirds of the general public sees religion as losing influence on society today, while a quarter say it is increasing its influence. There are few differences among religious groups about the influence of religion on society. But while the unaffiliated hold views similar to others in the general public about whether religion’s influence is waxing or waning, they are divided over whether this is a good or bad thing. Atheists and agnostics who see religion as losing influence on society mostly consider this a good thing; among all atheists and agnostics, more say the declining influence of religion on society is a good thing (43%) than a bad thing (10%). Those who have no particular religion are more inclined to see religion’s declining influence on society as a bad thing (32%) than a good thing (22%).